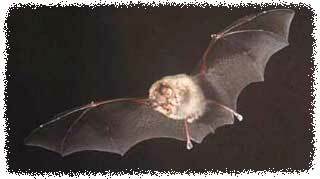 Bat Info: Florida has an abundance of bats: 18 species in all, though some are rare. Bats are not flying mice, or rodents. They are more closely related to shrews or primates. Though bats often get a bad reputation, they are not aggressive, and are often very beneficial in eliminating insects. Bats are not blind. They can see just fine, but they also use echolocation as a means of navigating complex flight and finding insects on the wing. A bat's wings are essentially the same as our arms and hands, thus the scientific name Chiroptera or handwing. The bones of the hand and finger are elongated and serve to support and move the wing. 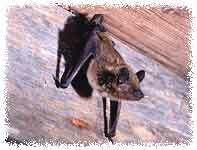 The hind limbs of bats are modified for landing and hanging upside-down. 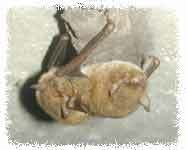 Bats become a nuisance when they roost in large numbers in human dwellings and bats love attics. The rapid and smelly accumulation of guano (droppings) is unpleasant, and serves as a fertile breeding ground for a fungal disease called histoplasmosis which is transferable to humans who breathe in the fungal spores. Bats are also known to carry rabies, a viral disease that causes progressive paralysis and death in mammals, including humans. Many people don't like the droppings littering the ground, or the noise the bats make, or the odor they emit, and many people are simply uncomfortable around bats. People are most likely to encounter nuisance bats when a roosting colony takes up residence in a building. Attics often make excellent habitat, as do barns. Bats need only a half inch or less of space to crawl through in order to enter a building. Once inside, if the habitat is good, the colony grows until the homeowner notices the bats flying out of the building, notices the droppings in the attic, chimney, outside, or even basement (when the droppings fall down the walls). Sometimes a bat will get lost and find its way out of the attic and into the living area. Occasionally a transient bay may also fly into a house. Bats commonly inhabit large buildings such as apartment buildings. AAAnimal Control is especially skilled at removing bat colonies. Call 407-233-3838 for an estimate. Please do not call unless you are considering hiring me. I handle Orlando bats and bats throughout the state. If you simply have general bat questions, there is plenty of good info on the web. You can also visit my special Orlando Bat Control & Removal website. Getting rid of bats requires experience. I have worked on dozens of bat problems in many complex structures. I once excluded a colony estimated at approximately 3000 members! My bat removal system ensures that the colony will no longer use your home as a roosting area, and that no bats can get back in. I care for the welfare of these beneficial creatures, as do many environmental agencies, so I do not aim to kill any bats. I merely exclude them from the premises and make sure they can't get back in. I also thoroughly clean the biohazardous droppings that they leave behind. Experience counts when working on bat jobs, and it takes a skilled eye to get the job done right the first time. Many people don't know where to turn when seeking bat control. The removal of bats is not the kind of thing that you'd hire a pest control company to take care of. You don't want bat extermination, that is not legal or ethical, and not the right way to get the job done. There is no such thing as a bat poison or fumigation system that will get rid of them - any attempt to use such means will only make the problem worse, by killing some of the bats and causing odor issues, or driving some of them into the house. No reputable bat removal company in Florida or anywhere in the country would ever kill bats as part of the process. Bats are valuable animals. They do cause problems when they roost in buildings, but they should not be treated like vermin. In fact, many bat species, and all colonies are protected by law. Unfortunately, they are difficult to keep away and bat prevention is not really a viable option. There are no effective bat repellents available. Furthermore, a quality company that does the job right does not actually trap the bat, but excludes the bats safely. 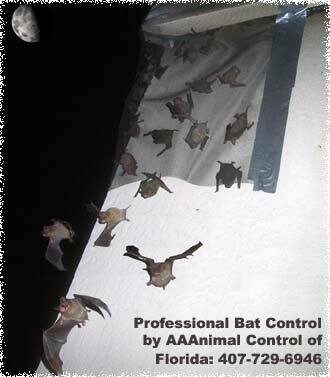 Many of the jobs are extremely challenging, involving very difficult to reach areas and difficult architectures such as bats in tile roofs AAAnimal Control provides this unique and specialty service throughout the state of Florida, or click here if you need Tampa Bat Control. I can also capture and remove a transient bat flying around in your house. Click here for examples of bat removal jobs I've done. Click here for an example of a bat job I performed. Click here for bat job prices. People don't often encounter solitary roosting bats. Solitary roosting bats mainly use trees as roosts but seldom use tree cavities. Most often, they hang under a large leaf or tree branch and blend in with their surroundings. In Florida, these most commonly include the Eastern Red Bat, Seminole Bat, and Northern Yellow Bat. People DO often encounter colonizing bats. Colony-roosting bats prefer to live in crevices such as tree hollows, caves, underside of bridges, and buildings, such as attics and barns. In Florida, these most commonly include the Big Brown Bat, the Brazilian Free-tailed Bat, the Rafinesque's Big-eared Bat, the Southeastern Bat, and the Evening Bat. One of the most abundant bats in Florida is the Brazilian Free-tailed Bat. This is the big one. Almost 100% of the bat removal work I do is free-tails. Their range extends throughout the state, and I've seen them in attics of all kinds, from tiny one-story homes to huge resorts. They love to live under tile roofs, which provide plenty of gaps for them to enter. Brazilian Free-Tailed Bats bats like hot temperatures quite a bit, and I've seen them living in incredibly hot tile roofs and attics. The Big Brown Bat is found in the northern half of the state, but not often by me. This bat is fairly common throughout much of the United States, but it's just not as suited to Florida as the free-tail, which takes up most of the resources. These bats really seem to love to live in man-made structures, with attics being a top choice. Under tiles, in gaps under bridges, in stadium gaps, pretty much any warm safe space they can squeeze into is fine by them. The Rafinesque's Big-eared Bat is easy to identify, what with its incredibly large ears. Imagine if you had ears of a little more than an inch long. This bat may live behind tree bark or in hollowed out trees, but will of course live in any suitable place, such as a building. However, you'll probably never see one, and neither will I, as it is quite rare. Poor Rafinesque, if only he knew what was becoming of his bat. The Southeastern Myotis tends to live near streams, ponds and lakes, because like all bats, it flies right to water for a nice drink before it dines on delicious beetles, moths and mosquitoes. In Florida, these bats remain active throughout winter and feed year round. 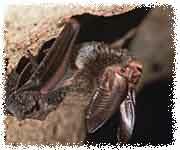 Southeasterns are primary cave roosters, and Florida is the place for the SE Myotis. Most of the maternity caves are located in this state, what with it being the most Southeasternish Myotisish state in the union and all. The Evening Bat is fairly common throughout FL. They are real small. If you find one, you might think that you've found a baby bat. Of course, it's rare for anyone to find bats at any time, so you probably won't. But if you find a small bat, and it doesn't have a free tail, it's probably an Evening Bat. Lucky day! You might in fact find one, because not only are they somewhat common (second to the free-tailed), but because they just love to live in buildings. 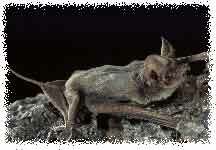 They are named the Evening Bat because they are active in the evening. Fancy that, from a bat! Call AAAnimal Control at 407-233-3838 if you would like to discuss your Florida bat problem and schedule an inspection.